(Photo: REUTERS / Amr Abdallah Dalsh)Egyptians carry coffins of Shi'ite victims killed in sectarian violence, following funeral prayers in El Sayeda Nafisa Mosque in Cairo, June 24, 2013. Egypt's president, accused of fueling sectarian hatred, promised swift justice on Monday for a deadly attack on minority Shi'ites as he tried to quell broader factional fighting to avoid a threatened military intervention. The Egyptian Family Home, which has Christian and Islamic backing, has appealed to the North African nation's army and police to tighten security measures to protect the churches and mosques. Known is Arabic as Bayt al-'a'ila al-misriyya, the inter-faith group called on the security forces to protect "churches the mosques, the national and the religious institutions as well as the sacred places" describing attacks on them as acts of terror. The Egyptian group condemned the invasion of mosques as well as setting churches on fire along with their cultural, charitable and educational annexes. 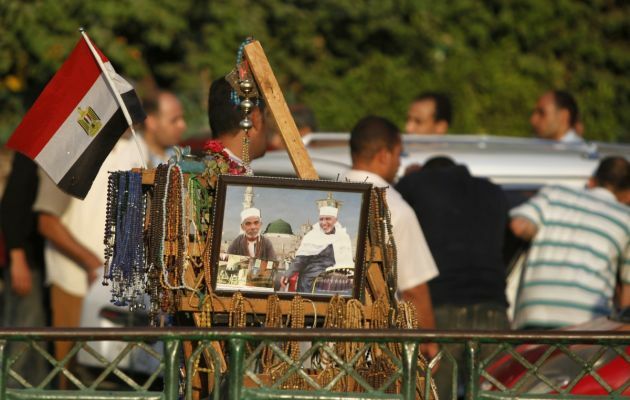 Since the army's ousting of Mohamed Morsi as president on July 3 attacks have soared against Egypt's Christians who make up about 10 percent of the country's 85 million people. But minority Muslim groups have also been attacked. Egyptian Family Home said also, "the arson that took place within the premises of Malawy City Council along with the headquarters of the Egyptian Family Home are considered as a part of this current terroristic tactics in an futile attempts to plunge the country into a state of riot, conflicts and sectarian strife." The group said on August 15, "Terrorism does not take into account the sanctity of religion." Amnesty Internation noted on August 20 that there has been an unprecedented rise in sectarian violence across Egypt targeting Coptic Christians and it urged Egyptian authorities to take immediate steps to ensure their safety. "Coptic Christians have been targeted – seemingly in retaliation for their support of the ousting of Mohamed Morsi – since the violent dispersals of pro-Morsi sit-ins in Greater Cairo on 14 August," said Amnesty. "Several Coptic Christians were killed, while their churches, businesses, and homes have been under attack. "It is a shocking dereliction of duty that security forces failed to prevent these sectarian attacks and protect Coptic Christians. The backlash against Coptic Christians should have been anticipated following the dramatic rise in similar incidents since Mohamed Morsi was ousted," said Hassiba Hadja Sahraoui, deputy director for the Middle East and North Africa at Amnesty International. "Attacks against Coptic Christians must be investigated and those responsible brought to justice." In Geneva, the World Council of Churches general secretary, Rev. Olav Fykse Tveit, expressed support for the interfaith calls to action for peace and security in Egypt in a statement on August 23. The day before, speaking at the annual meeting of the Ecumenical Advocacy Alliance which works for food justice, Tveit encouraged religious leaders to work together to call for protection and to promote the sanctity of human lives and religious places. "Protection of all human life and sacred sites is a common responsibility of both Christians and Muslims. "The WCC supports and stands in solidarity with the call for joint action and efforts for reconciliation and security by the religious leaders in Egypt," said Tveit. Founded in 2011, the Egyptian Family Home as an initiative of the Christian and Muslim leaders in Egypt collaborates with WCC member churches in Egypt, including the Coptic Orthodox Church.